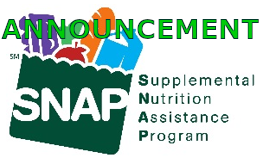 Per instruction received from the United States Department of Agriculture (USDA) in response to the Federal government shutdown, Supplemental Nutrition Assistance Program (SNAP) food benefits for February will be issued early, January 16, 2019. Counties should continue all other SNAP operations as usual. If you’d like more information regarding SNAP Food Assistance please visit our page with more details and information by clicking the link HERE.